AB: We thought you would be great to talk to because of the academic side of your work; tutoring young students on how to think about their spatial future; but also because you have straddled between work with Riwaq and Decolonising Architecture. YA: My experience is territorially related to the West Bank, because I don’t know what’s happening in Gaza, because we’re so disconnected, and I don’t know what’s going on with the Palestinians living in Israel. What I know is that planning as a discipline is something really new to Palestinians, because formerly it was Israelis who were planning on behalf of Palestinians because of the military administration. They were deciding on the expansion of cities and the direction of expansion; permits; where you have a green area and where you’re allowed to build, so it [already resembled] Areas A, B, C.
I think, personally, that there was a sort of history of Areas A, B and C in the military administration under the Israeli occupation [before Oslo], because the land use wasn’t really that different. There were so many places where you were forbidden to build, especially near settlements; and now they are Area C. The expansion of cities was always limited by the Israelis, surrounding cities, so these are Area B. Even for Area A, there were municipalities assigned by the Israeli administration – for example Ramallah and Nablus – and they used to configure the spaces under this administration. Planning as a discipline – having a sovereignty over space and dealing with movement in spaces of goods and money, and knowledge – is [still] not available; you don’t have that. Palestinians cannot really control anything. So, this rhetorical question of whether you can have planning without sovereignty and full power over space; these are questions that we all academically try to explore. Actually, I think of planning as something else. Planning is about managing your own state, even in a short space of time; you don’t have to plan for 25 years within these constraints; you can really manage your problems in the time being and try to make them a little bit more acceptable; to make the best out of the situation. So for Palestinians nowadays this is planning; they’re trying to deal with all the constraints and make the best situation out of them. But this also has so many pitfalls, because it is like accustoming yourself to having constraints. Accustoming yourself to living an abnormal life, and normalising that kind of abnormality. If we stop thinking about this as an abnormal situation, trying to use planning [merely] as a means of surviving that abnormality, then I think we’re going to lose it and we’re going to normalise the abnormality; and that’s a big problem. This is something we have to think about in planning in Palestine; you have to think about the abnormal situation and emphasise it. At the university, we’re trying with the students also to question whether planning should be used for dealing with the current situation, or whether planning should be a tool of opposition, and changing the power structure of the whole Israeli negotiations. For example, why not plan in Area C; it’s forbidden to build there, but why not try to do a masterplan for that area for things that we need, and then use that document for negotiation. Personally, I think this is the way things change; producing arguments, and flipping the power structure of negotiations towards the Palestinian side; so it’s not dealing with the restrictions of Area A, B and C; it’s taking that kind of structure and trying to revolt against it, or subvert it. This is something that we do; and from that we were working with Decolonizing Architecture on several things, like Oush Grab and P’sagot. We also have independent courses in advanced urban design where we ask the students to study and have discussions and try to figure out a way to deal with these things in a positive way. AB: You were talking about using planning as a tool to flip the current power structures. Do you see that as a way, for now, to work inside the existing framework and try to realise projects within that; and then, beyond that, setting the foundation for something after? Or is it not necessarily about realising projects at all at this stage? YA: You cannot realise the projects because technically it’s impossible; you don’t have permits; then it’s subject to destruction, so they do that. I went to visit some villages for the 50 Villages [Riwaq Biennale]; and in one village there was a part that had been totally destroyed – a new part. I was asking what this was, and they said it was the Israelis, and that it was Area C; and that was so close to the old part of the village. So they do [destroy buildings without permits]. As Palestinians, we are always waiting for proposals from the Israelis, or the Americans, or the international community; and the proposals are spatial, and deal with the provision of space in the solution, and the territorial definition. Our problem since the Oslo agreements has been the lack of knowledge of our geography, and the lack of knowledge of the assets of the place; the potentials and the resources that we have; the way that these might be utilised in a bigger vision which is, say, a state. As we didn’t have all this kind of information, and a vision for that, I think that we always succumb to the idea of receiving proposals from the Israelis and the Americans. I think it’s time to go beyond that. Instead of negotiating with something that you don’t know, to start to use planning and the understanding of space, and try to negotiate things that you want. To say: “This is our geography, and we think that this area needs this; and this is the basis for your Palestinian state building”; and I think that we have to use that as a negotiation document with the Americans. “If you want peace, this is the peace that we want; our state will look like this”. By that I think you can destroy the linearity of the way negotiation is happening between Israelis and Palestinians. AB: I’ve read in various places about the Oslo negotiations, and the complete lack of any kind of cartography on the part of the Palestinians; that maps were presented by the Israelis and then read by people who didn’t know how to read maps. But now there are many NGOs who seem to be constantly mapping every element of the occupation. Do you think that this is going to empower Palestinians in terms of their thinking? You were saying there was a lack of knowledge before about their geography; do you think people are becoming more aware of that already? YA: No, I don’t think so. I was totally shocked when I started working with Riwaq on the 50 Villages. The whole landscape; these villages that I’d never been to and never knew existed; I was shocked. At one point I was about to cry; there was a small hill, and there was a sort of military base that was evacuated by the Israelis; and the Director of Riwaq and I were standing up there, and there were plains and agricultural fields all over; it was beautiful, sensational, with the light, it was amazing; for me this is rediscovering Palestine. I think the occupation has played a big role in confining Palestinians to certain geographies; physically and also psychologically. I don’t know if you know about ‘learned helplessness’? I always talk about learned helplessness by the way. It is a psychological syndrome that essentially was based on the work of Ivan Pavlov (a Russian physician) and then afterwards Martin Seligman (and American psychologist), and what he did is that he induced helplessness in dogs. The work of Seligman was used by the Israelis in the 1970s for psychological warfare. One of the applications is the checkpoints. Seligman took three dogs, all connected with electric wires, and there’s a bell, and when the bell rings all the dogs take a shock. Eventually the dogs associated the bell with the electric shock, so when they hear the bell, dogs start to yelp, and then they take the shock. The first dog had the option of pressing a lever and, if he learned to press the lever after the bell, he could escape the electric shock. The second dog was connected to the first dog; so if the first dog pressed the lever, he would escape the electric shock as well. But the third one, no matter what he did, would get the shock. So, after a while they started seeing that the first dog and the second dog were barking when hearing the bell, but the third dog stopped doing anything. This is learned helplessness, because the dog learned that he would take the shock anyway. So, they took the three dogs and unshackled them, and when the pressed the bell the first dog and second dog ran away, because they realised that they were free from the chains; but the third dog, even though it was unshackled, it stayed and took the shock. So, this is learned helplessness. Actually it seems that one can really induce helplessness in human beings. There were so many experiments in this that I don’t want to talk about it, but checkpoints are one of the forms of learned helplessness. When they started checkpoints it was unsystematic; there were flying checkpoints, as we call them, and these came at different times of the day. It was inconsistent, so after a while you realise that you cannot really comprehend the timing system, and you can’t really guarantee that you can leave one city towards somewhere else – like going from Ramallah to Beit Sahour – at that time. Eventually people have learned to become helpless, and to stay put by themselves. This is the cheapest way of occupying a people, and controlling a massive amount of people. So when they reduced the checkpoints, I didn’t really bother to go to Nablus, to Bethlehem. I stayed in Ramallah, and it took me a while to face this syndrome, and break it, and start to travel around. So this is also how the occupation is becoming cheaper; and how space and spatial planning has been used by the occupier as a self-controlling device. It’s amazing; I’m always thinking about that. Actually, Palestinians have informally been countering such military psychological planning. The yellow taxis were always really good at finding ways through to different cities. So this is like a kind of planning coming from people. It doesn’t really relate to a [top-down] system so much as it relates to a collective system. I used to study in Germany, and these cabs took me to Jericho; and around Jericho [the Israelis] dug a big trench in order to forbid these taxis. These taxis always used to find a way across the desert; they would go over the sandy hills in the middle of nowhere, with no street – no infrastructure for any car to go there – and they would always produce this kind of service that’s against the military planning. So, there’s always a sort of popular collective non-systematic planning for solving issues. But then its dealing with problems [only in a reactive way]. AB: Like the tunnels in Gaza, or something like that? YA: So it’s more a need-oriented planning; and it’s not really a forecast of whether you know it’s going to be useful in the future or not. So, it’s the future is the thing that’s really vague. For me, I cannot plan for the future because I don’t know what’s going on. But now you can see some kind of strange economic change in the map of the region, now that we see Salam Fayad. Salam Fayad is betting on an economic-based peace; which means going back to plans done in the period of the Oslo agreements between the Americans and the Israelis and the Palestinians on having an economic region, mainly in the Jordan Rift Valley. There’s a huge project on the website of the Israeli Ministry of Internal Affairs about future projects, and one of them is the Jordan Rift Valley project. It’s a huge, crazy project that’s forecasted as the economic region of the area – the whole of Palestine, Jordan and Israel – where you have industry, tourism, agriculture, education connected with Aqaba; it’s connected with Egypt, and you have tourism trails going up to [the Dead Sea]. They have crazy plans if you look at them; it’s a huge plan for the whole region. Now, if you see what’s happening on the news, you really start connecting that; ideas to build back the railways between Jordan and Israel and Palestine, as if to go back to 1996 and re-implement these ideas. My question is how independent are we economically? This is creating lots of problems in Ramallah for example; land in Manarah is costing $24million, because there’s no regulation, so it’s becoming crazy. Investors control what’s going on here, and nobody else; there’s no regulation, and nobody can complain. It’s always a kind of chaos because of this unregulated economic system. This is something else that has been produced. AB: On this idea of how projects going on now could lead the political process – every solution seems to be a spatial solution – do you see a forum for spatial planners and architects to lead the political process in some way from outside of the political sphere? Are there any elements that you have seen in small things that are happening, that maybe point the way towards larger things to happen that way? YA: Well, let’s look at some projects. Housing projects, for example, around Ramallah involving the Palestine Investment Fund – a partnership between the government and [private] investment – they’ve assessed the needs of housing for Palestinians; and I think it’s also based on a future solution when part of the refugees will come back to the West Bank; how can we, as Palestinians, take them? And they’re really producing lots of schemes and designs for big new cities here. One of them is Rawabi. It was initially designed for people with limited income, but suddenly it seems that the prices they are proposing are something like upper-middle class levels; and they are relying so much on the donor institutions that will pay for the refugees to come back to buy these houses. There are projects that are planned for near Jenin and Nablus and Qalqilya; so it’s going to be all over the West Bank. AB: So all of these projects – Jenin, Nablus, Qalqilya, Rawabi – they’re all based on the assumption of a political agreement happening first, and some refugees returning, and money being given in compensation for these refugees? Or are some of them being realised under different terms anyway? YA: Well actually it’s not only meant for the refugees. Palestinians in the West Bank could buy a house there; but I think they’re really thinking about producing an infrastructure for a case where a lot of Palestinians return, so they can house them and provide services for them. I think some of these projects, like Rawabi, are really being engaged with the Americans. I don’t think such projects are really done hypothetically on no basis. I think there’s some kind of political planning for these projects. AB: I didn’t read through everything on the website, but Rawabi seemed very strange. It looked very much like the Israeli hilltop settlements. It seemed like a settlement for Palestinians within this Israeli fabric [not the Palestinian one]. YA: It looks like [a gated community]. The problem with these places is, first of all, architecturally and spatially we’re following so much the Israeli language of planning and dividing land and housing. Not only the architectural language, but the urban fabric of such complexes. It’s not only these complexes that look like Israeli settlements, but if you go to some areas [on the edge of] Ramallah, it looks like a settlement. It’s a language that we’ve adopted. It’s becoming part of us without us really noticing that it’s a colonial injection of aesthetic. But it’s normal; if you look at Algeria, there are always architectural styles and elements that seep from the colonial regime into the local style. AB: But it’s also a two-way thing. The colonial regime may even consider this to be their interpretation of the local architecture. YA: Absolutely. Actually, there were so many Palestinians in the 1930s and before that were going to the United States. The settlement is like typical suburban housing in the States; so it’s a suburb, and they all have pitched roofs and private gardens. They used to live there, and they came back with these kind of aesthetics. For example P’sagot; when we did research with Decolonizing Architecture we found that the municipality of East Jerusalem under the Jordanian regime had decided to build a housing project for [well off] Kuwaitis where the settlement is; and the divisions of the plots were the same as were taken as a basis for the settlement. It’s not like they [the Israelis] invented something and we just took it; it seems that there have been examples of such planning [by Palestinians]. The Palestinian Authority, by itself, is a project that’s going on. I think it’s not really a project that you can uproot easily, because it’s an institution. It is complex, people who are living here are part of that institution; you’re talking about salaries to support families. Most of the Palestinians are living off money coming from the PA [directly or indirectly]. Itself, it is a structure of bodies and institutions that have physicality everywhere. I always wonder what can come out of that structure. AB: I do hear discussions where people talk about the need to envision a new political system, and that you can’t do anything until there’s a new political system in place to think ahead. Those things seem kind of incompatible; it’s just another way of fantasising; there are structures that exist now, and if there’s not a clear path to realising different structures, then surely you have to somehow inhabit the structures that exist? Do you see possibilities – perhaps from the perspective of the university – how these kinds of changes could come about? YA: My basic concern is that we’re so dependent on these structures nowadays. They’re corrupt and incapable, and they don’t have the capacity to do anything; the people working there are not trained; they don’t have the knowledge. I think that, economically, we have to leave them the way they are now and work on a more grassroots social system that allows people live without a dependence on these structures. By forming that kind of independence, at a certain point we can help in rebuilding it the way we want. But we need a real independence from these structures; isolating them. There’s a kind of psychological thing that we depend on these structures to politically, socially and economically work on our behalf. But we really need to be independent from these structures to deal with them. TE: Where would the physical or material support for such an independence come from? YA: Well now it’s the NGOs. But I think, for example, what Riwaq is doing is essential. 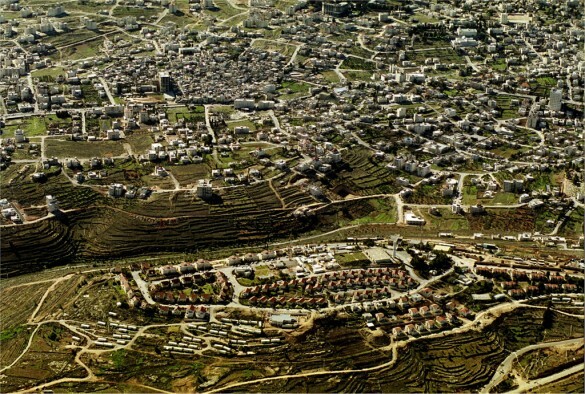 This idea of creating sustainability and bringing back life to villages, where villages can become a place for production; not industry but as a place where people can generate income, and stay there, and have opportunities there; and also conserve what is Palestinian: the landscape; the cultural heritage; the buildings. If you really activate these fifty villages, I think this is a really big national project. AB: So, you’d see that as a route towards bringing some independence to these communities; and that they could therefore have a stronger power structure of their own, so they could have an influence centrally? YA: Yes. For the whole of West Bank and Gaza to be independent from the power structures; they can really be used by new leaders as something you can lean on to make change. So it’s easier to win support. For me, as a leader, if I would have such independent social structures, I could really use them as a bat to win a big political change; because the PA is really something which has been imposed by the international community, and has been manipulated by the Israelis, and [the international community] give money for these people. So if people learn that they can really produce a lot of income, and they can survive without the PA; I think this is really a good thing. Isolating [the PA]; I think this is a part of the solution. TE: How could this grassroots civil society guard their independence from their donors; because as soon as they want to do something that maybe has anything to do with economic models that aren’t neo-liberal, they might lose their income. How would you see this? YA: Well, Riwaq is managing quite well, because they’re producing employment and people are really interested in historic centres; and they want to stay. The younger generations are not [leaving]. I think this is the problem, because younger generations are coming to urban centres; if you go to the villages you can see only old people. So, for example, there’s one of the villages called Beita near Nablus, and what they’ve done is a sort of cooperative. They were Hamas, so they didn’t get money from the PA; but what they’ve made is a public-private company and have gathered investors from Hebron and Ramallah and other places, and they have a spring and they’ve started a bottling company; and now their revenues as a municipality are becoming even more than when they were working with the PA. This is a good example, I think; and we have to promote such examples. They’ve done so many projects by themselves; so it’s just the will. AB: On a broadly related topic. Are there research projects at the university that are looking at issues of national planning, or regional planning? 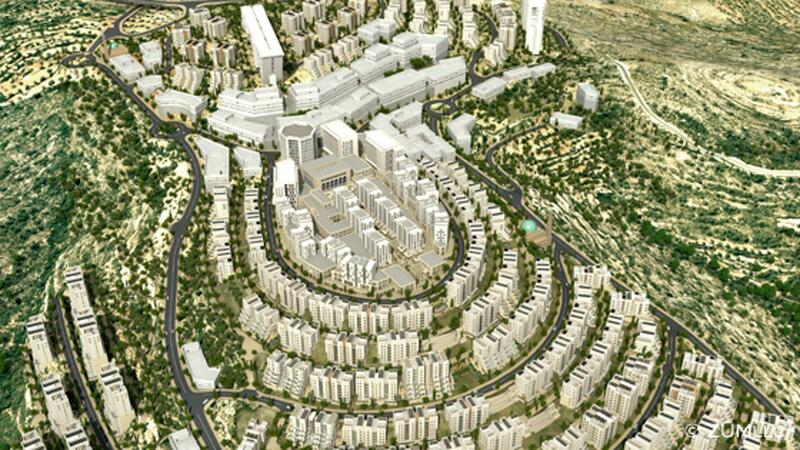 YA: The planning programme at Birzeit is a very young one – since 2003 only – it’s very new. It’s still stumbling a lot, because we don’t have lots of Palestinian planners, and we’re sending so many people abroad to learn and then teach on the programme. We’re doing so many cooperations actually; we have cooperations with Germany, with Belgium, and we’re trying to revive the programme. We don’t have good Palestinian planners; it’s a new thing; we’ve never been given the responsibility of planning for ourselves. TE: If people go abroad to study “good” planning – whatever that might be – then they would have acquired these skills for, say, a German context; but when they come back they would have to act in a Palestinian context. How would you see that you could work with that tension? YA: I studied in Germany by the way; in Dortmund. In Dortmund I learned how Germans normally plan their space. My belief in planning as a discipline that is taught at Dortmund is something that is so systematic; so normative; and it’s non-creative. The students there are like “we have to do 1, 2 , 3” and if you miss “2”, you’re dead meat, “you can’t do that”. For me it was a disaster; but I’ve done my PhD, so I’ve been reading on these things. For them, power and planning is something that you shouldn’t think about. Power and planning in terms of game theory and economics only; but political power and suppression, they don’t tackle these issues. To me, my professor was saying that you are one-sided, Foucaltian, and you should really see all the sides, and he was born as a Christian, and there’s objectivity. TE: I think it’s not only Dortmund, because I think that planning as a discipline in Germany – and also in Europe – became strong as a discipline in university with the idea of the manageability of society, and the approach of planning and foreseeing population development. One has to learn the opposite. AB: We’ve been trying to speak to people in Israel as well; looking at the possibility that there are lots of different future scenarios, and can you plan for multiple future scenarios? The idea of building grassroots movements within just the West Bank; can that spread to the Galilee, even to Jewish Israeli groups? I suppose the fundamental situation is that you have a single hierarchy of [political] power in the whole territory. Talking about this internal power struggle on the Palestinian side seems to be about creating a united Palestinian voice to approach another [higher] authority. Have you seen examples of things that are happening on both sides of the Green Line? YA: I’m so much a visual person. I really lack this spatial experience behind the Green Line. I cannot really imagine anything. AB: Are you able to travel to Israel? Do you have a Jerusalem permit? YA: No. I don’t know what’s going on behind the Green Line. For me, I didn’t even know anything about these villages [in the West Bank] until recently. AB: There was something going through my mind in Tel Aviv; that this kind of ‘normality’ of Tel Aviv might be what this whole thing is protecting on some level. All of the ‘tentacles’ of the state of Israel are protecting these small enclaves of normality. There are these enclaves throughout it, but maybe Tel Aviv was the epitome of the normality that it wants to protect. TE: That would be like saying the raison d’etre of Israel is Tel Aviv; and it’s not like that. AB: I mean it might be the epitome of the normalcy that the occupation aims to ‘protect’. TE: It’s not the highest priority aim. Settlers have a completely different agenda. YA: It’s very interesting; the idea of normality and Tel Aviv; why it’s not normal? Now it’s normal; it’s on the maps more than Ramallah, and more than East Jerusalem, or any Palestinian area. It’s on the international tourism map; it’s the destination of every single European; it’s the “White City”; it has UNESCO [granting it heritage status]. It’s like every other city; they have skyscrapers and an economy going; tell me what’s abnormal in that situation? AB: It’s the example of the enclave. You can be an individual within the context of the Israeli-Palestinian conflict; but you can say “I’m not political; I don’t have political opinions”. You’re afforded this kind of luxury. YA: The normality of Tel Aviv is the political statement behind the State of Israel. AB: Exactly. It’s the political statement behind being able to say that you’re non-political. TE: But that normality is always a result of a process of normalisation. It is always something constructed and political. YA: Tel Aviv; like Ramallah, like everywhere else; it’s a growing city; it has so many parallel forces happening. AB: I wonder whether planning under occupation will only ever be little green shoots of things sprouting here and there, but it’s never going to be something that’s completely [coherent]? YA: That’s interesting, because what I think is that nowadays the power structure that drives planning in a space is beyond being hierarchical. It’s more decentralised, and it’s coming from different levels and directions; it’s so complex. In old times you used to have the king, and you had to deal with the owner and the king, and that’s it; but now we have to deal with traditions; with the economy; with so many levels of things coming from here and there and we really comprehend all of these kinds of forces in order to understand how planning is really practiced. I think this is [also] a really interesting way of resisting the kind of indirect and decentralised forces that manipulate planning; building these kind of moments of resistance that are also decentralised. No planning entity or official entity can really see it ahead of time and fight it; so decentralised that you cannot really deal with it anymore. So I think this is really a wonderful way of resisting; resistive planning, let’s say. AB: In East Jerusalem, for example, you can look at the situation from different perspectives. From one, you could say that [the Israeli authorities] are constraining growth in the Palestinians areas and destroying and destroying; this is the headline story. But actually there’s also a subtext to it; that people are building and building and building without [Israeli] permits, and maybe the Israelis are actually failing because they simply can’t destroy houses at the rate they’re being built. Maybe that’s a microcosm of a new kind of chaos, and people could work in a concerted way in the sense that they just build. YA: Exactly; and there’s no control of this. AB: But that would certainly go against what Farhat [from Riwaq] was saying, which was that he thinks the horrible thing in Ramallah, for example, is that the zoning offers so few constraints. Your only real constraints are height and built footprint, and you end up with a horrible city. YA: It is a horrible city, but I love it. I like the idea of chaos so much actually. I hate planning. AB: It’s also fascinating how much the development in the Palestinian cities in Israel seems to have mirrored the Palestinians cities here [in the West Bank] since 1967 considering that, on the face of it, they have developed under quite different circumstances. YA: You have to understand what’s going on in the Palestinian villages in Israel. They have even stronger constraints than here. The planning council is totally [Jewish] Israeli; these people are deciding on behalf of Palestinians living there. I don’t know if you know the example of Ein Hod? Ein Hod is a village that was abandoned in 1948. One family of the village stayed in Israel and settled on a mountain nearby, overlooking the village. The village was taken and used more recently by artists. In the end, the internationally community pushed that they should do a plan for the new village on the mountain, because it was never approved by the Israeli authorities, and they needed to be officially recognised in order to start planning. They decided to make a big competition to plan the new Ein Hod, and it was so horrific because all of the planners – all of the internationals – were abiding by the Israeli planning regulations there, and worked within these kinds of limitations. 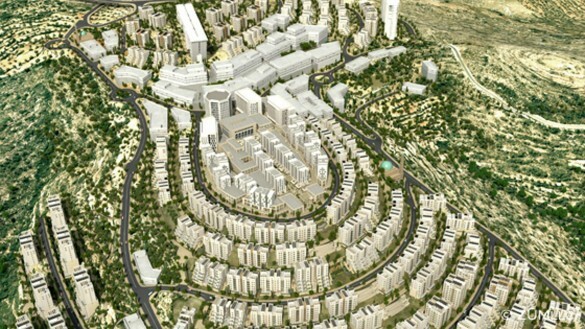 The product was a competition that produced what the Israelis really wanted to plan for Ein Hod. The Palestinians living there are really in a worse situation; at least here you can talk with people and decide to do something bad and just do it.